An iPhone owner who claims AT&T billed him for data usage that was impossible because he'd disabled all data services on his phone has filed a class-action lawsuit in federal court in California, seeking to include all iPhone and iPad users who were similarly defrauded by AT&T's "rigged" billing system. Plaintiff Patrick Hendricks claimed in the suit that "AT&T's bills systematically overstate the amount of data used on each data transaction involving an iPhone or iPad account," and charged customers for data transactions even if they didn't use the device, Courthouse News Service (CNS) reported on Jan. 31. Hendricks' lawyers described AT&T's billing system as "a rigged gas pump that charges for a full gallon when it pumps only nine-tenths of a gallon into your car's tank." Out here on the pseudo-progressive Left Coast, major private California insurance company Blue Shield announced that healthcare premium hikes of as much as 59% are scheduled to take effect on March 1. A company spokesman told CNN that the gouge increases had "almost nothing to do with the federal health reform law" [emphasis added]. Unfortunately, as CNN noted, "[t]he federal government does not have the authority to review and strike down unreasonable rate increase requests. Historically, that authority lies with individual states. But some states don't have any rate review process at all, and insurers can hike rates as much as they want." The 1993 movie Groundhog Day is the perfect metaphor for so much of what happens in the U.S. — including (or maybe especially) anything having to do with finance or corporate crime and corruption. Bill Murray plays a Pittsburgh weatherman who's forced to cover a saccharine annual event in rural Pennsylvania. The assignment is his idea of hell, and he tries desperately to get it over with as quickly as possible so he and his two-person crew can get out of town and back to the "big" city. But the weather — and fate — intervene, and Murray's character is forced to re-live that same day over and over again until, after exhausting every duplicitous and underhanded strategy for exploiting the situation to his own advantage, he is finally able to restore the normal timeline only by abandoning his cynical and self-serving attempts to "game" a system he knows all too well (by dint of its repetition) and fundamentally altering his entire approach to life and his relationships with the people in it. Well, anyone who's lived through one of the recent boom-bubble-corruption-crime-bust-bailout cycles that have gradually supplanted the actual economy in the U.S. must be hearing the strains of the 1965 Sonny and Cher hit I've Got You Babe*, because it should be clear to everyone by now that Wall Street is perfectly happy with the lucrative predicament it's in, and has no interest in fundamentally changing anything — and that the government's pathetic pantomime of financial reform doesn't even begin to approach the level of systemic change needed to break us out of yet another econo-temporal loop. 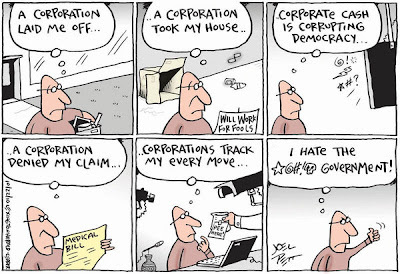 Read more about Who elected corporations? Daily Finance (and many other publications) reported Dec. 6 that the Supreme Court agreed to hear an appeal by retailing behemoth Wal-Mart over whether 1.5 million of its female employees, who accuse the company of paying lower wages and denying promotions compared to their male counterparts, can sue as a single class. As DF writer Abigail Field notes, "even if the women lose, they could in theory start over, seeking to sue as a different kind of class. Or each employee could [still] sue individually. However, given that nine years and many millions of dollars have been spent bringing the case this far, it's hard to see [them] starting from scratch." Forbes magazine reported Nov. 29 that Wikileaks, the non-profit transparency collective responsible for releasing classified U.S. government documents on the Iraq and Afghanistan occupations — as well as the more recent U.S. diplomatic cables that have revealed behind-the-scenes international political machinations, embarrassing governments around the world — will turn its focus to corporate skullduggery in 2011. In an interview with Wikileaks founder and director Julian Assange, Forbes quoted Assange as saying that his organization still has millions of documents it has yet to reveal, and that roughly half of them come from inside corporations — including pharmaceutical companies, finance companies, and energy firms, among other industries. Daily Finance reported Nov. 26 that the U.S. Justice Department has increased enforcement of the Foreign Corrupt Practices Act (FCPA), which prohibits American companies from bribing foreign officials. Quoting the FCPA blog, it noted that in 2004, "two individuals were charged under the FCPA, and criminal fines collected that year were around $11 million. In 2009 and 2010, over 50 individuals have been charged, 35 await trial, and nearly $2 billion in fines have been collected." Perhaps one way the government could reduce the national budget deficit would be to actually enforce the laws against corporate malfeasance, and in addition to sending corporate executives to prison — a punishment (and simultaneous deterrent to further crime) that is sorely lacking — collect large (not slap-on-the-wrist, cost-of-doing-business) fines that would eat into shareholders' take and make corporate crime a money-losing venture. The San Francisco Chronicle reported on Nov. 20 that corporate serial killer Pacific Gas & Electric (PG&E), whose poisoning of groundwater in the farming community of Hinkley, Calif. (some 100 miles northeast of L.A.) and subsequent effort to cover it up was the basis for the hit anti-corporate film Erin Brockovich, is downplaying evidence that the problem has moved beyond the affected area in the original lawsuits that Brockovich and her firm brought on behalf of the town's cancer-ridden residents. Brockovich, who at the time was an untrained legal clerk, discovered and pursued evidence that PG&E knew for 30 years that a toxic metal called hexavalent chromium (also known as chromium-6) from one of its plants had been seeping into the town's water sources, leading to the largest toxic tort injury settlement in U.S. history: $333 million for more than 600 Hinkley residents. In response to an alarming increase in childhood obesity and diabetes, San Francisco's Board of Surpervisors over-rode a veto by the city's outgoing mayor to enact a new ordinance that prohibits fast-food restaurants to include toys with meals that do not meet basic nutritional standards, CNN reported.